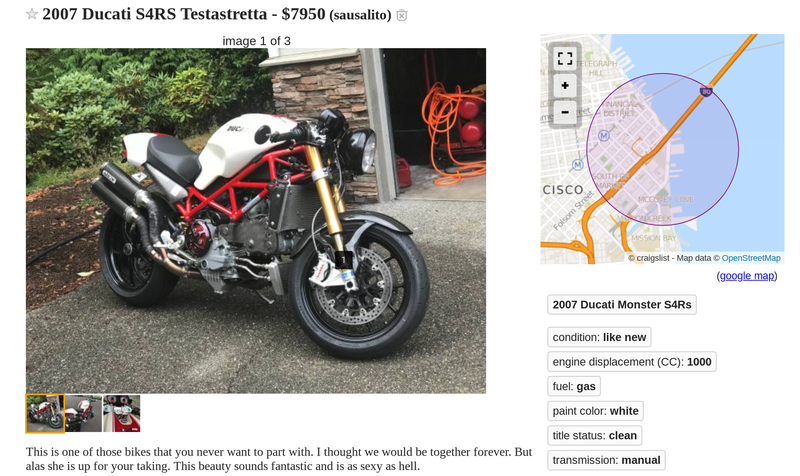 If you search for 'motorcycle rental san francisco' you'll get the most expensive options up first - Dubbelju and EagleRider. Dubbelju is a great business, and they'll take care of you, but you'll pay upwards of $120 a day (and $200 a day for some models... that are really cool). If you have a large budget, go with them. But if you don't... there are two main places you can rent a motorcycle for as low as $25 a day, or on average $50-75 a day (for shorter, more flexible rentals). And one last option that's a bit of a hack that might work! Option 1: MotoQuest Transporter Specials - One Way Motorcycle Rentals for as low as FREE a day! These are poorly documented specials available from one of the cooler rental agencies in the Bay Area, MotoQuest. MotoQuest has a number of locations around North America and needs to transport motorcycles between them. Rather than pay $500 to transport, they know that a rider might RENT a motorcycle from them, and pay THEM to transport them. You'll be transporting between these facilities. 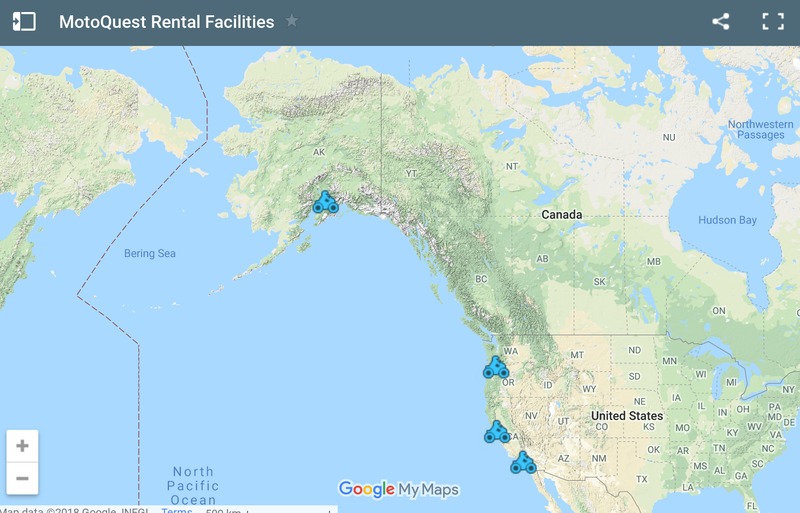 Some one-way motorcycle rentals are between California and Anchorage, Alaska! Sign up for the newsletter on this page to get alerted about new transporter specials. If you wait long enough... occasionally, there's a free option! FREE RENTAL! Free rental for an epic one week trip from Long Beach, California to Portland, Oregon! Who's the lucky bugger who got this? So cheap! And amazing high quality motorcycles from an established rental agency. Their high-end bikes, like BMW R1200GTs and R1200RTs, plus Honda Africa Twins and everything else in the touring/adventure category, usually cost $150+/day to rent. So getting them for $50 a day (or free if you're flexible or patient) is pretty incredible. I used Riders Share as a motorcycle owner for a few months towards the tail end of my stay in San Francisco, and can vouch for the quality of (most) riders. As you know, as a rider, most people don't ride their motorcycles most of the time. Riders Share is an opportunity for people to make money off assets sitting around, renting them out for quite cheaply - as low as $20-30 a day for extended rentals of an older motorcycle. 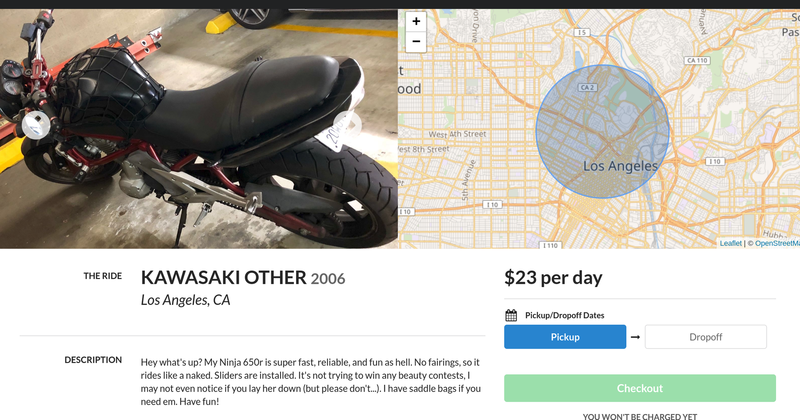 This naked Kawasaki Ninja 650R in LA is a steal! I'd have rented it for fun. To rent a motorcycle, you choose your dates and your rough area, sign up and pay a deposit. Riders Share does a background check on every rider to make sure they have a valid license, and then sends a request to the motorcycle owner - who has to specifically approve every rental. The rider then communicates with the owner via email or text and confirms details like pick up time and gear, and picks it up. This is such a cool way to try out every motorcycle you've ever wanted. Want to ride a Ducati Monster? Triumph Scrambler? Zero? Suzuki GSXR-750? Rent one! I'd definitely, definitely do this before buying another motorcycle - if I have the option. Be flexible in pick up and drop-off time - don't bank on being able to pick it up directly from the airport - and know your local transport options like Lyft, Uber etc. Pack light. I had a few people show up who had over-packed. Happens all the time. The major risk... the owner can cancel the rental with no notice. It is rare, but I know it has happened to some renters. Say you're interested in a bike but have never ridden one. It's difficult to tell you're going to like it just from sitting on it, reading a review or riding it around the block - unless you're an extremely experienced rider (most of us are not). What to do? One of my friends, Moto Mike from MotoJava in SF, recommends you offer any motorcycle seller $50 to take their motorcycle for a day. If you like it, you buy it and take $50 off the selling price. If you don't like it, you give them the motorcycle back and they keep the money. Call them. Ask them specifics about the motorcycle to make sure it's something you'd actually buy. Mention you have never actually owned a motorcycle like that and are not sure what it's like to ride, and mention over the phone that you'd be interested in borrowing it for a day for a price, and see if they'd be interested. Give them a chance to think about it. Tell them you've done it before and will give them paperwork so they know you're legit. Negotiate the price you'd be willing to buy it for, but put in the condition that you want to borrow it from them for a day. Take with you photocopies of your ID and a contract, and get them to take a photo with you and the motorcycle - so they know you're not just stealing it. Basically any motorcycle on the market is something you might be able to borrow or rent. A lot of people will say no. It involves doing your own legwork. And there's a chance that they'll claim you stole it. Hopefully not though. And please, be genuine and honest if you try this approach. Don't do it if you just want to thrash a motorcycle - I'd hope people doing this actually want to buy the motorcycle. Respect the community, and it respects you back, I find. I've heard it works. I haven't done it, but I have heard it works. If you have done it, let me know! I tried moving from a Macbook Pro to an iPad so you wouldn't have to. I couldn't make the 100% switch to an iPad as a professional, and here's why. How I launched Pilgrim Coffee, going from an idea and no clue to an app in the App Store in 2 months.